The annual Bucsu festival was held between 20-22nd July, and to date we have never received so many visitors before. The weather was glorious...blue skies and summer sun. Radha-Syama welcomed 8550 guests during these three days: 1200 people came on Friday, and 4550 on Saturday, which was an absolute record! During the Bucsu Summer Fete, devotees show guests around the inside of the temple every 15 minutes and this year they had an extra opportunity to visit one of the devotee couple’s homes as well: Lilasuka Dasa and Brijbasi Devi Dasi opened the doors of their home for the visitors to view inside to get an idea of the Krishna conscious way of living. People were very keen to take the opportunity and they had more than 1000 visitors in three days...amazing! We organized another new location as well called the Beauty Island, which was very popular among the ladies and the young girls as they could dress up in sarees, get mehndi painted and hear about Indian beauty secrets. Of course these new programs ran paralell to the old successful programs we’ve been having for many years as well. The Vedic weddings were an attraction for many and since we don’t have an Indian community in Hungary, this is the only way people can participate and experience an Indian wedding taking place. It is a very special time watching the audience bless the couple after they have taken their vows: they put one hand on their hearts while raising the other, chanting the maha-mantra three times in unison and blessing the couple on their onward future journey in family life. Those who visit the “reality tent” can experience what it feels like to be a Hare Krishna devotee: they can learn how to put on sarees and dhotis, chant on beads, fry puris and offer their food. 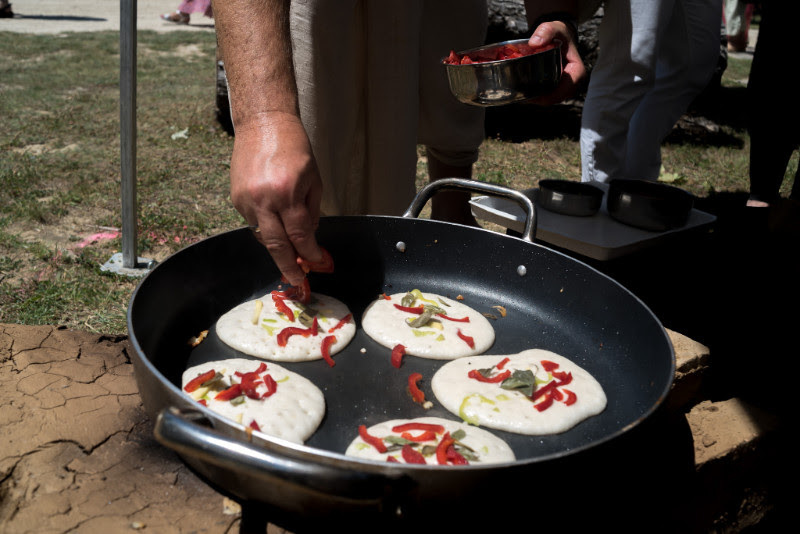 Those who visit the mantra path chant one round step by step, and at the “wisdom island” people can get answers to their philosophical questions where at Manjuwali’s kitchen they can see how Indian dishes are prepared and cooked right on the spot! So in a nutshell: this years Bucsu was a great successful preaching event! 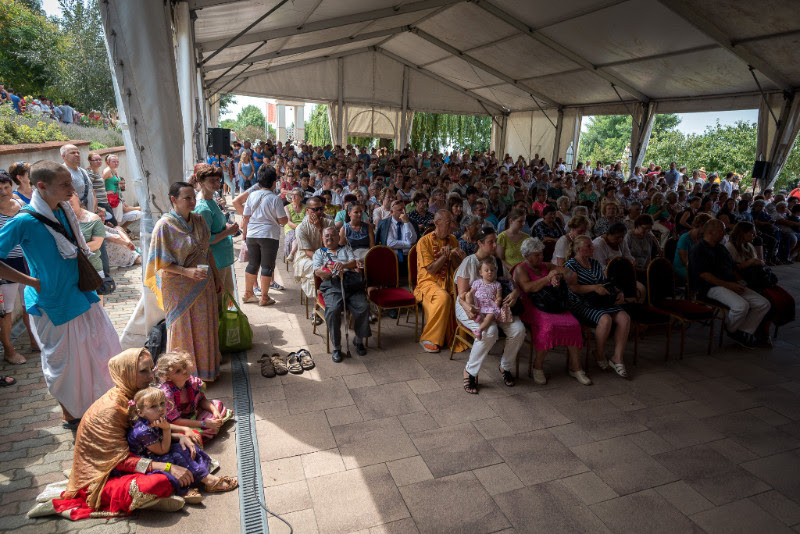 However it would not all be possible by the efforts of the local devotees alone, so from all over Hungary others came and joined in with the services here during this time. Undergoing so many austerities with travelling distances, they then work hard for three days to satisfy Radha-Syama’s guests. Radha-Syama were completely satisfied with their efforts and those who participated on the final ecstatic kirtana during Sunday night, at the end of the Bucsu, would have had no doubt about it! 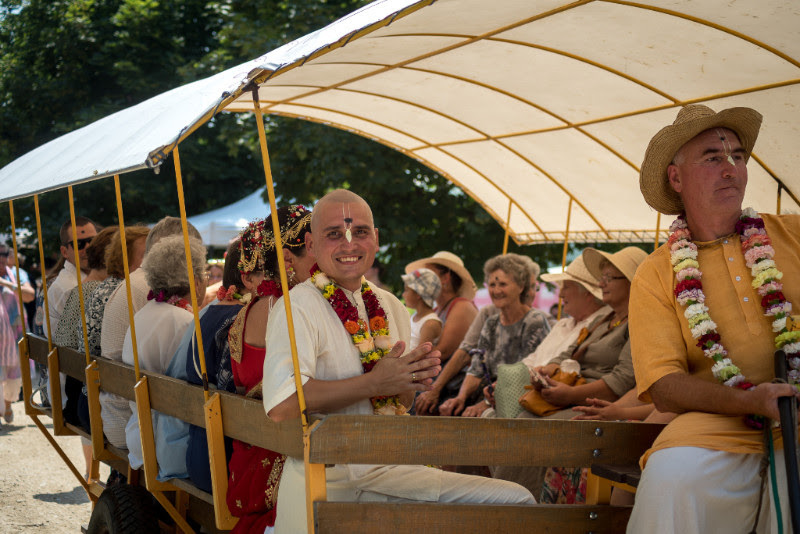 During July two devotee families started to sponsor new Nitya-sevas in instalments and a kind friend of the devotees volunteered for two Nitya-sevas, promising that if he has the opportunity he will also begin another two. This would make him the third donor sponsoring 4 days of worship of the Deities: His Holiness Sivarama Maharaja was the first who contributed for four Nitya-seva days along with a family at Budapest who have finished sponsoring one of them, paying the other three by instalments. We have three families sponsoring 3 Nitya-sevas, and we have more and more devotees taking on two. Thank you so much for all of you who volunteered for sponsoring those one, two or more days of service for the pleasure of Radha-Syama and Gaura-Nitai and to all of you who help out with regular donations to fill up the Nitya-seva fund. We are looking forward to more donors picking the other free days and if there are any of you who would like to take up the sponsorship of 4 days or more, the opportunity is still there!